On Tuesday December 13th, there will be a seminar at CERN about the search for the Higgs boson using the 2011 dataset. Physicists at ATLAS and CMS have been working very hard all year (and are still working) to show the results for 5fb-1 each. This means that we will have 5 times the amount of data available since the last update, and we can expect the exclusion of the Higgs to be even more impressive than what we saw in the summer. Since this an important milestone in the search for the Higgs boson, I will be liveblogging the event, from the main auditorium here at CERN. 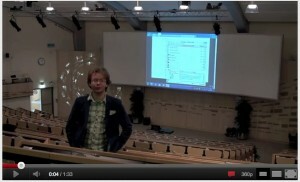 There will be a webcast available for those of us not at CERN. (The webcast details will appear on the seminar page on the day of the seminar.) So please join me on Tuesday, watch the webcast and follow the liveblog for minute by minute updates of the search for the Higgs boson. If you want to know more about the Higgs boson I’d recommend you look at Flip’s recent post. Check out the link to the Seminar page. Follow the updates with the Twitter hashtag #higgsliveblog.